What is the Expanded Panama Canal? The Panama Canal Expansion is the largest enhancement project since the Canal's opening in 1914. Considered and analyzed for a decade with more than 100 studies, the Expanded Canal provides the world's shippers, retailers, manufacturers and consumers with greater shipping options, better maritime service, enhanced logistics and supply-chain reliability. The Expansion included the construction of a new set of locks on the Atlantic and Pacific sides of the waterway, creating a third lane of traffic and doubling the cargo capacity of the waterway. What is the capacity of the Expanded Canal? 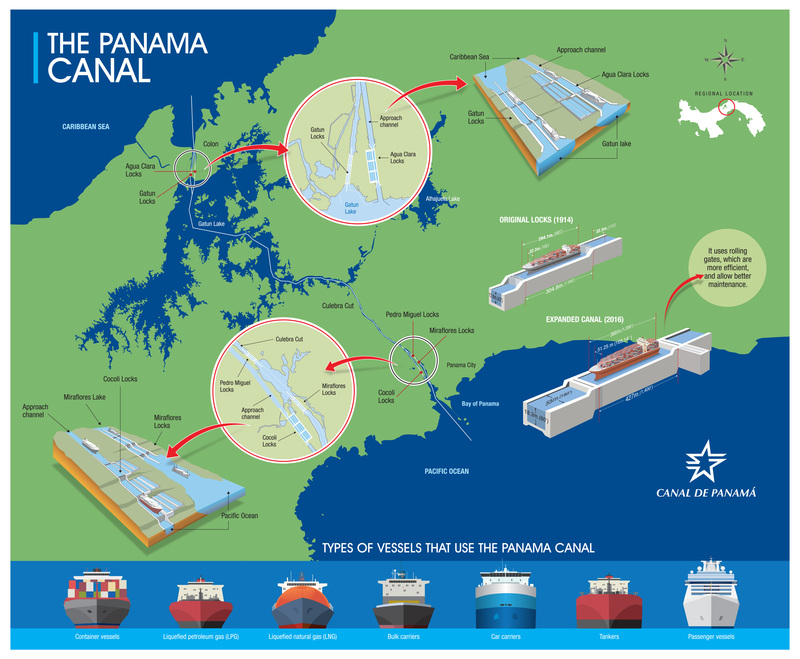 The Panamax Locks allow the passage of ships that can carry up to 5,000 TEU. The Neopanamax Locks allow the passage of ships that can carry more than 14,000 TEU. What are the dimensions of the Neopanamax Locks? The Expanded Canal's lock chambers Lock are 427 meters (1,400 feet) long by 55 meters (180 feet) wide, and 18.3 meters (60 feet) deep. Neopanamax designates ships that exceed the maximum size of the original Miraflores, Pedro Miguel and Gatun Locks. These vessels use the Cocoli and Agua Clara Locks..
How does the Neopanamax Locks work? How are they different from the Panamax Locks? The Panamax Locks -- Miraflores, Pedro Miguel and Gatun -- are 304.8 meters long and 33.5 wide. Water enters the chambers through culverts on the floor of each chamber. On the Atlantic side, Gatun Locks has three steps to raise and lower the ships from Gatun Lake, while on the Pacific side the steps are divided between the Pedro Miguel Locks (1) and Miraflores Locks (2). The Neopanamax Locks -- Cocoli and Agua Clara -- are bigger to allow the passage of larger vessels. The locks chambers are 427 meters (1,400 feet) long by 55 meters (180 feet) wide, and 18.3 meters (60 feet) deep and they have culverts on the sides. What are the water-saving basins? While the Expanded Locks are 70 feet wider and 18 feet deeper than those in the original Canal, they use less water due to water-savings basins that recycle 60 percent of the water used per transit. What type of vessels transit through the expanded Canal? What has been the largest ship to transit the Neopanamax Locks? The CMA CGM Theodore Roosevelt is the largest capacity vessel to-date to ever transit the Expanded Locks, with a capacity of 14,863 TEUs.How are pilots trained to transit in the Neopanamax Locks? How were pilots and tug captains trained to transit the Neopanamax Llocks? The Panama Canal’s hands-on education, preparation, and training programs help to ensure the continued reliability of the Panama Canal and that its existing and new locks will run seamlessly. These programs are related to the training of the Canal’s talented Pilots and Tugboat Captains, consisting of three core elements: SIDMAR, the Scale Model Maneuvering Training Center and Vessel Transits. The Panama Canal’s Center for Simulation, Research and Maritime Development (SIDMAR) offers the same immersive, 210-degree training experiences that Canal Pilots and Tugboat Captains previously had access to; however, it has been updated to provide training that simulates transiting Neopanamax vessels in the fully Expanded Canal. The Panama Canal inaugurated its state-of-the-art Scale Model Maneuvering Training Facility on March 23, 2016. The training facility—which complements simulation training received at SIDMAR—is devoted to ship handling and training to scale. The innovative 35.3-acre training facility features two lakes connected by a channel modeled after the Canal's Culebra Cut. The new facility features docking bays, replicas of the new and existing locks, gates, and chambers, all at a 1:25 scale. The facility is equipped with a number of meticulously created scale model Panama Canal tugboats, as well as scale models of real ships. Ahead of the inauguration, the Panama Canal conducted exercises with a chartered Neopanamax vessel to perform trial transits through the Expanded Canal.